I'm obsessed with this kitchen. And chalkboard paint. As I'm only days away from moving into my new studio apartment, I've been thinking of little ways to make my old apartment unique. It has tons of classic character - hardwood floors, a clawfoot bathtub, farmhouse sink - and I'd like to add to that. 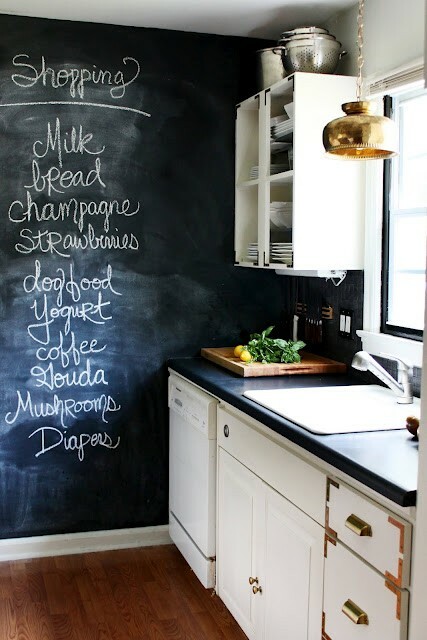 While I'm not sure my landlord would appreciate an entire painted wall, a chalkboard is a great idea for my studio kitchen. Whenever it is that I own my own home, I'll whip out the chalkboard paint and begin painting the entire wall. One day! I love it! That dress/earring/flats combo is completely perfect for Thanksgiving!! wool blanket camping.